I found the next book I’ll be passing around to friends and family members to help them put handles on the transforming power of God’s love for us. Before he was the evangelism linebacker, a pastor, a seminary graduate, or an author, Derwin Gray played linebacker for the Indianapolis Colts from 1993 – 1997. Read his longer bio here. The big idea of Gray’s book is that many of us (most of us) spend a good chunk of our lives living out the implications of the destructive labels we have been given (and that we’ve given ourselves). He calls these labels “soul tattoos” that are ingrained deep in our hearts to the degree that they determine how we see ourselves. 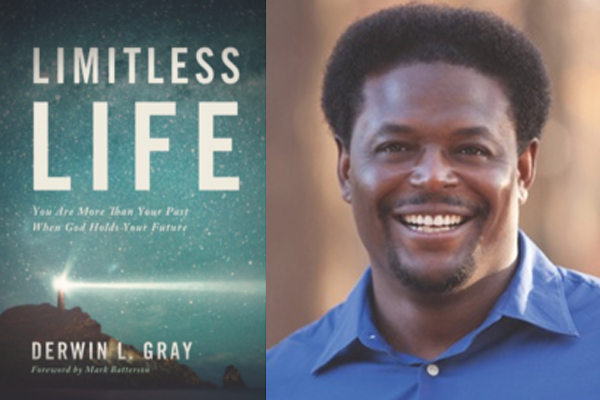 Gray’s goal in writing Limitless Life was to help people see themselves as God the Father sees them! He writes: “When that happens, everything changes. Life becomes limitless (p. xii). I agree! You also get to know the author in the pages of this book! Gray isn’t shy about sharing his own story and his own struggles with every single label in this book. It’s truly an experience of walking with Gray through is own journey — like a friend who helps you by sharing God’s word as it has shaped his own life. It’s a teaching testimony of how God can (does, and did) change a person’s life! Limitless Life isn’t just a book to read. It’s a tool to take with you on your journey with Jesus, and with your friends who are journeying with you. Each chapter contains a section called TRANSFORMATION MOMENT that emphasizes three points of application: Head, Heart, and Hands. The Head section emphasizes the big idea from the chapter. Gray says, “I want you to use that idea to wallpaper your mind” (p. xiii). The Heart section emphasizes direct contact with God in prayer. These are Gray’s own written prayers (to get you started) using very intimate language toward God in order to inspire the reader (pray-er) to press into relationship with God as the primary point of transformation. As an important observation here — this is one of the reasons why this book is not a “self-help” book, but is rather a “God, help me!” book. It is an invitation from God, in the form of teaching, testimony, and application, to let HIM into the broken places of our lives so that we can live the Limitless Life God has for us. The Hands section (speaking of application) is a call to action. Here, Gray will take on the role of coach. He’ll point out the play on the field. He’ll share practical applications, and the things that we must do in order to see the change we’re looking for. Buy your own copy and begin reading it, working through it, and watching how God reshapes you into the image of His dear son! Buy two more copies, and give them to friends who may not even be Christians. Tell them you were thinking of them, and you wanted to give them a gift to encourage them. Start a community group of 3-7 people, and go through this book together. Walk it out as a group and watch God move! Invite Pastor Derwin to come and speak at your event or your church. Heck, if he accepts the invitation, you might even get him to wear his jersey and knock a few people out! I received a complementary review copy of Limitless Life in exchange for an unbiased review. 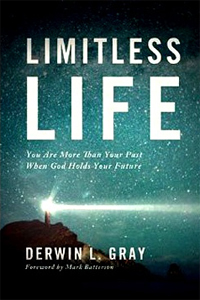 Limitless Life by Derwin L. Gray (2013). Published by Thomas Nelson – about 215 pages.